The Grenade was a legendary transmitter built by Radio Animal, the operator of WKND. It was sold to a number of pirate radio operators in the early 1990's. It is unknown how many were constructed. The Grenade was a 10 watt, single-band, crystal controlled AM transmitter for use on 41 meters. Radio Animal used several interesting techniques, particularly with regards to modulation. He also went to great lengths to obscure part numbers and values. Radio Animal disappeared from the pirate scene not long after completing a number of these transmitters. They have become prized, and many operators have gone to great lengths to reverse engineer or construct similar circuits. One such circuit is the Corsair by Dave Martin. Grenade clones have successfully been built by Channel Z Radio, Ground Zero Radio, and WAZU. 2003 marks the 10th year of the Grenade radio. The first Grenade was built in Texas USA from surplus and bought parts, early in 1993. The idea had its base in an amateur QRP transmitter called the "Two-fer" that Sparky of K-Zap radio had built in the late 1980s. 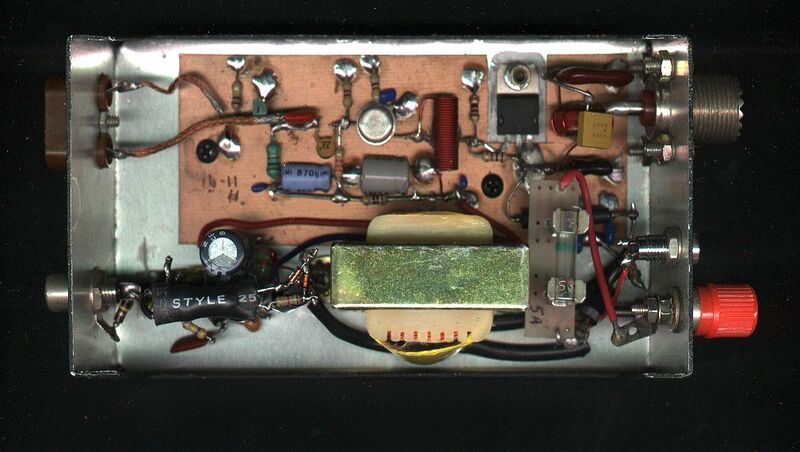 This one watt kit was intended for Morse code use, and it didn't have a modulator circuit, but it was a complete shortwave transmitter on a 2 by 3 inch circuit board. Radio Animal modified the Two-fer and added a one transistor series modulator, then put it all in a small metal project box with audio and antenna connections to the outside. It wasn't perfect, but the concept of a one box, 12 volt transistorized transmitter got its start with that little rig. Awhile later, a new design was started, and this time it was fully based on the classic and dependable high level modulation technique that AM broadcast transmitters have used for years. The first shortwave Grenade type transmitter was built for the 20 meter band, where crystals were available for testing, and because it was suggested that a higher frequency band might be a better choice for portable operation. Smaller antennas used at the higher frequencies can be easier to store and transport, and less height is needed to mount them, and yet still get an effective signal in the air. The case for this first Grenade was a used aluminum box that had been the former home of an FM amplifier. At testing stage, the beta version of this transmitter's radio frequency section was built on a 2x2 inch copper clad circuit board, using point to point wiring, and very tight construction! For testing, a voltmeter, ammeter, and a field-strength meter with a probe was used to measure the RF signals at different points of the circuit. One of the plans was to do away with any kind of external modulator, because a single unit transmitter would be more reliable, easier to use, and it would get rid of extra connections in the system. The modulator, which is an audio amplifier circuit that adds sound to the station's signal, had to put out about 10 watts and operate from the same 12 volt supply as the transmitter. We looked at schematics from CB radios, intercoms, and bullhorns for design ideas, but those weren't quite right. New autosound systems operate from 12 volts, and the output stages are integrated circuits, so that would avoid having to build an entire modulator from seperate parts. There were no new autosound output ICs available in the lab at the time, so a junk car radio was opened, one of the output sections was circuit-traced and written as a schematic, carefully removed from the radio, and then rebuilt on a seperate circuit board as a potential modulator for the Grenade. It worked well, after some modifications. The car stereo was rated at 14 watts per channel, with outputs that were operated in bridged mode (balanced). This is an excellent direction to take for a simple modulator in this application, because it gives more audio headroom, so the same IC can be used as a modulator for higher power transmitters too. Many servo motor driver ICs could also be adapted for use in this circuit as well. Current 40 meter Grenades don't use this type of modulator, because after tests, it wasn't seen as necessary for a 10 watt RF output. The first test broadcast with the completed transmitter was done in late May 1993. The show was The Voice of the Unknown Ghettoblaster at 14975 Khz, playing music by Ice Cube and other Rap, along with announcements and funny comments by the operators about the FCC chasing after the station, which was broadcasting from the middle of the ghetto. The claimed location of 'Ghettoblaster couldn't have been further from the truth of where it really was broadcasting from! The test station's name was really appropriate, because it's unknown whether the broadcast was heard by anyone except the operators.. This page was last modified on 8 January 2019, at 17:27. This page has been accessed 39,708 times.